The 1960s may have been the time that women’s hats were on the wane, but they sure put out some wild and crazy beach hats. Many were Italian straw creations, and were decorated in all sorts of ways, most of which reflected a tropical vibe. There were hats that sprouted a straw palm tree on the crown, and hats covered with seashells. I’ve even seen them covered with fishnet with tiny plastic fish caught beneath. But my all time favorite is the beach hat with built-in sunglasses. This hat came in lots of different color combinations and several different shapes, but this one in orange with blue lenses is a classic. I tried in vain to find a reference to this hat in my collection of 1960s magazines, and an internet search was not much more fruitful. I found only two vintage images. One was dated to 1965, and came from a Dutch magazine. Since I was not sure of the origin of the scan I’ll not post the photo here, but it is my hat in red straw. The other was not dated, but looks to be a bit earlier, and is the hat in tan. As always, any additional information is greatly appreciated. 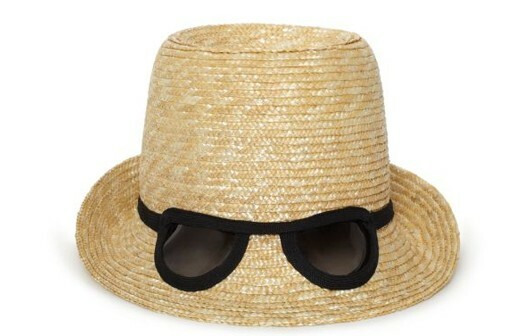 A couple of years ago an updated version of the sunglasses hat was available at Kate Spade. Fell free to speak your mind, because I like the vintage one better too! Liz…I like the old hat better. The only improvement in my eyes would be for it to be one of those lovely Crunkleton Mannequin Heads. I have never owned one of those sun glass hats, but have always loved them….kind of the same purpose as those umbrella hats…but cuter. Since I love both orange and blue, this hat is a hit with me. I’m not sure how practical it would be, but the hat/glasses combination would certainly shield your face from the sun! The problem with the contemporary version is first of all the shape of the glasses and second that it doesn’t seem to have a sense of humor. Maybe that’s something that can’t be copied as easily. Yes, love the detailing in the vintage one! Ha ha ha ha ha ha! I actually laughed out loud at this hat! And, yet, I’m strangely attracted to it and want one! I knew I could count on this bunch to agree that the vintage version is better! I definitely like the vintage version better too though I do like how Kate Spade takes inspiration for her designs from vintage. I wonder how well you can actually look out through the sunnglasses in the hat? Yeah! The old hat is but better than the Kate Spade one. Thanks for sharing! You always have the most fantastic stuff! The vintage hat is vaguely familiar to me – I wonder where I saw one before. It looks somehow elegant while the modern one looks like a silly hat you can find at a theme park. It seems like you would have very limited vision in such a hat but it is a clever idea! I think a lot of the reason the vintage hat works so much better than the Spade hat – besides, let’s face it, superior Italian style – is that the vintage hat maker has gone to great lengths to give the illusion that there really is a pair of glasses, or goggles perhaps, strapped to the hat. The Spade “glasses” are cartoonily flat and follow the shape of the hat rather than creating the shape of real glasses. This tips it over into cheesy party-store territory, especially when joined to the depressingly plebian undyed straw hat shape and “glasses frames” that look like they were cut from black felt. This is an after-thought…has anyone ever seen the umbrella (for rainy days) that is shaped like a huge…for real, large brimmed straw hat?? The sun glasses hat reminded me of other hats with dual purposes. Well, that is incredible! I appreciate your posting the link. I guess now I need to expand my search back to 1954. Hayley Mills wears a terrific hat with built in sunglasses in the film The Chalk Garden, one of my favorite summer films. Oh, great! Another must-see film for the list. I found one of these hats yesterday. I have been trying to find out more information on them. Just saw this in a movie with Sandra Dee A Summer Place. Love it so much. The vintage one is so much better! I just put that movie in my Netflix queue. I can’t believe I haven’t seen it, so thanks!